An event's body starts with the keyword event. 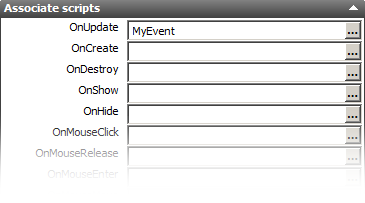 Next there's the name of the event, in this case MyEvent, followed by a dot and the event type, OnUpdate. Unlike regular functions, there are no parentheses. If you compile the code above, Novelty will recognize it as an event and you can associate one or more objects to it. You do this in the Property inspector (while an object is selected) under Associate scripts. In this example, we've bound MyEvent.OnUpdate with an object, which means the code will be called every frame for that object. Another argument that is passed to the OnUpdate event is elapsed which is the time passed since the last update. Objects are automatically bound to events with the same name, so an object named "Ball" will be automatically bound to the Ball.OnUpdate event.